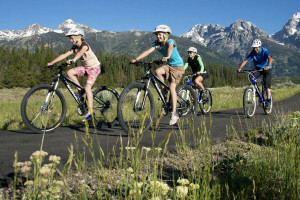 Whether you enjoy a leisurely family ride on the new Park bike path, or getting onto gravel road along the Snake River, enjoying the beauty of the Grand Teton National Park area on two wheels is the experience of a lifetime. 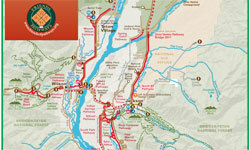 Explore Grand Teton National Park on 2 wheels! Bike rentals from Giant & Diamondback in a variety of sizes. Kids bikes & kid bike trailers. Enjoy a guided bike tour with your family & large groups! Book a 1/2 day. Full day or multi-day tour for your adventure needs. All experience levels welcomed! Biking is restricted to roads and designated trails in the park. Find exhilarating single tracks just beyond the park’s borders. Bike rentals cost about $40 per day. The mountainous area provides exciting challenges for road bikers. For stress free riding, hire a local guide! 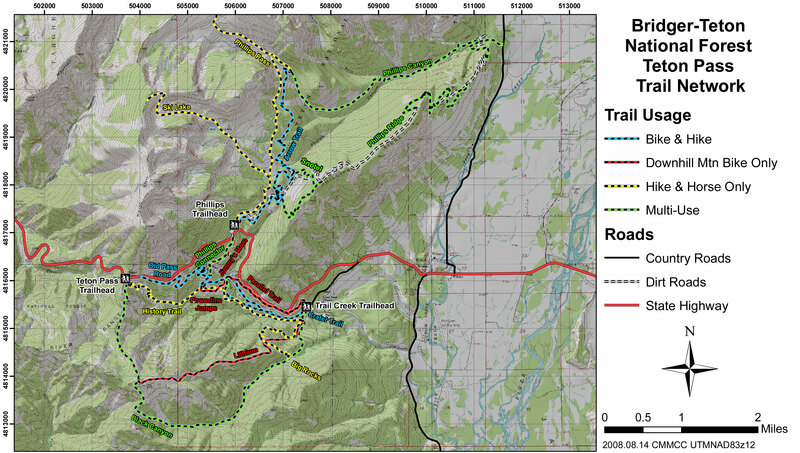 Biking is limited within Grand Teton National Park boundaries to roads and designated trails. Outside of the park, mountain bikers will find heaps of single track trails and road bikers will encounter challenging mountainous rides. 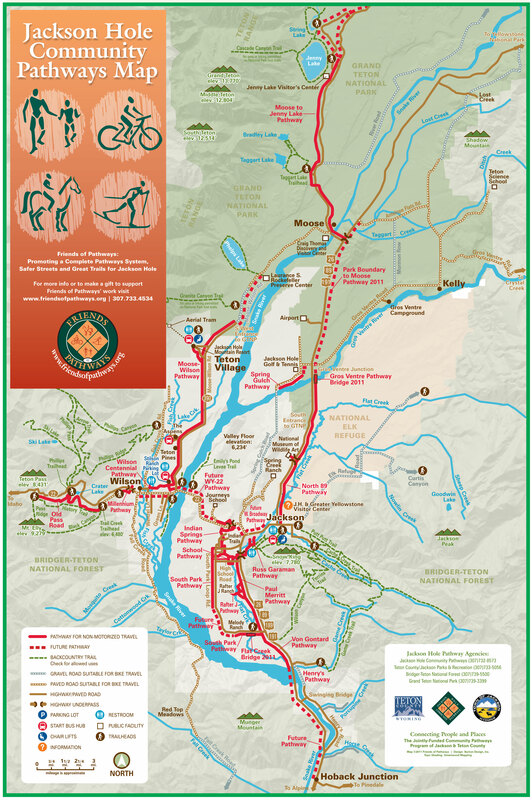 Pick up a local trail map for trails throughout the valley or better yet, explore this page for local biking outfitters and hire an experienced guide to lead the way. Summer is the best time of year for this sport and it’s one that can be enjoyed by people of all ages and ability levels. 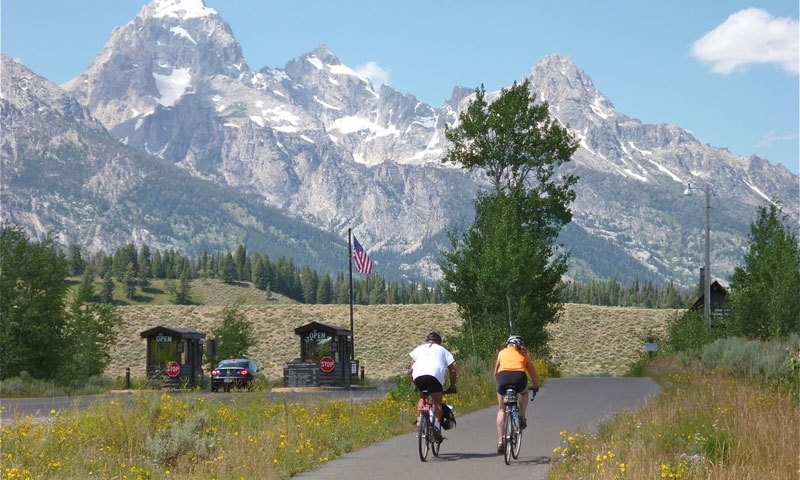 The opportunity for scenic road biking in and around Grand Teton National Park abounds. Nothing quite compares to riding down the park’s inner loop road, past the snowcapped Tetons and meadows of wildflowers. 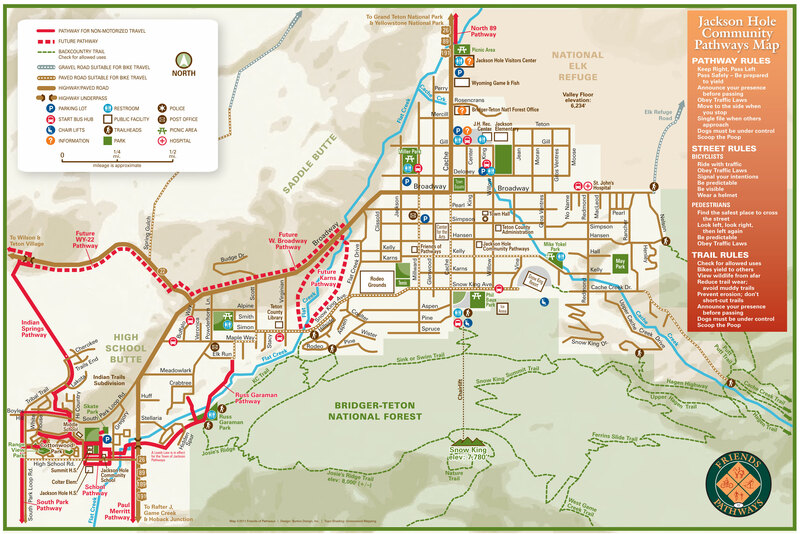 The paved section of the Gros Ventre Road offers a scenic route past the Gros Ventre River and Slide Lake and Antelope Flats Road takes bikers through sage covered hills and past historic sites. Steep mountain passes and a well maintained network of highways give road bikers seemingly endless terrain to ride. 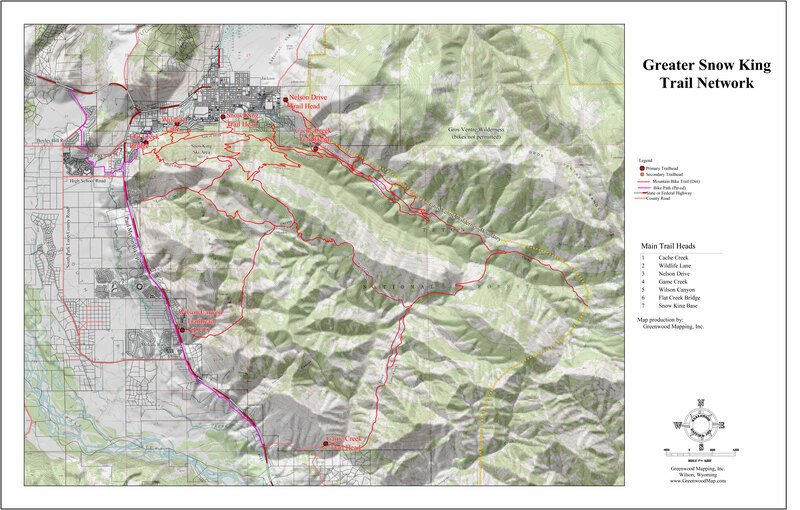 Mountain biking enthusiasts will have to look outside the park for their downhill adventures. Close to the park’s south entrance you’ll find exhilarating single tracks on Shadow Mountain or near the Gros Ventre River. 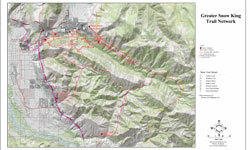 In the town of Jackson, Cache Creek and Snow King Mountain have a variety of cross-country and downhill mountain bike trails. 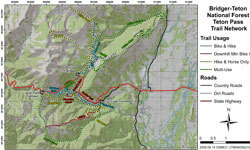 The south end of the Tetons offers double black-diamond runs like Phillips Canyon, Black Canyon, and the Arrow Trail. Grassy Lake Road rounds the north end of the Tetons, and provides excellent views of the upper Snake, Tetons, and the Pitchstone Plateau of Yellowstone. If you are visiting during the winter months, try out the new fun sport of snow biking. You'll ride an actual mountain bike, equipped with fat studded tires which allows you to ride packed winter trails. 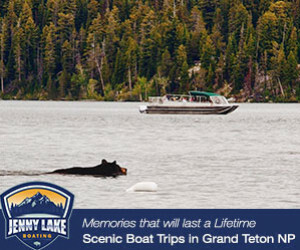 A great activity for non-skiers with awesome views. Tours and rentals are available. 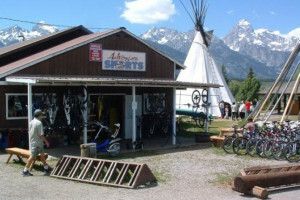 The Jackson Hole area turns into a biker’s paradise in the summer and multiple shops in town provide bike rentals and safety gear. Daily rentals cost about $40 a day. If you are new to the area or a novice to the sport, book a guided through one of the outfitters listed on this page! 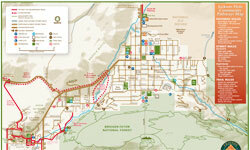 The following maps have been provided by Friends of Pathways in Jackson, Wyoming. The Adventure Cycling Association is a club that encourages and helps plan travelling throughout the country via bike.